Bled Island on Lake Bled, Slovenia. Photo courtesy of Pexels. Some images have a way of haunting our day dreams and mood boards (and Instagram feeds), compelling us to find out the story behind the picture — like this island on Lake Bled, Slovenia. Maybe it's just me, but I can't seem to spend any time on social these days without seeing one (now) familiar image: a charming bell tower perched upon a tiny, verdant island, surrounded by an immense, spectacularly blue lake. This is Bled Island, on Lake Bled, in the town of Bled, Slovenia. (Is it odd that I find even this redundancy to be unwittingly charming?) Slovenia, one of our top travel picks of 2018, is quickly gaining a reputation as one of the global leaders in sustainability, and nowhere is the harmonious relationship between man and nature more evident than on Bled Island. 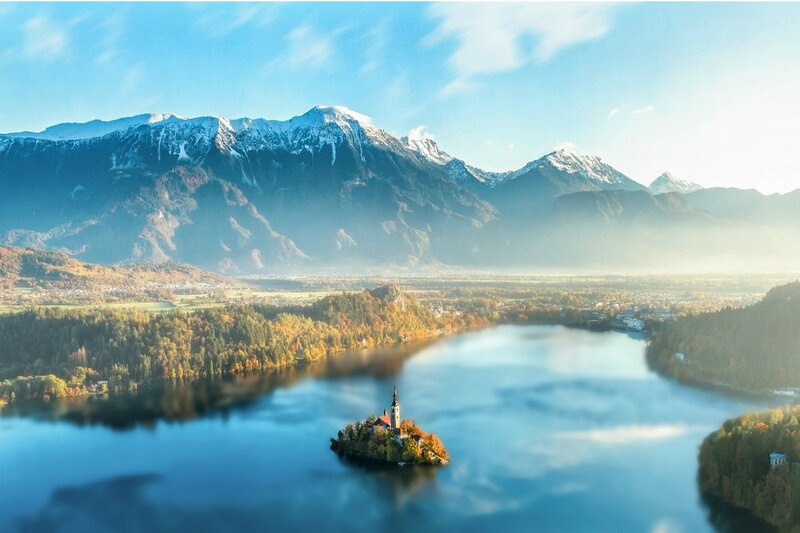 The tiny isle, dotting the waters of serene Lake Bled, bears evidence of human activity dating back to pre-Christian times, where a Slavic temple to the goddess Ziva is believed to have once stood. The island's predominant structure, the pilgrimage church dedicated to the assumption of the Virgin Mary, was built towards the end of the 17th century, while the iconic 52 meter free-standing bell tower dates all the way back to 1465. When viewing Bled Island from the shore, the church and bell tower loom tall above the tree line while lush greenery obscures several smaller buildings, creating a whimsical illusion of a forested tower rising almost spontaneously out of the lake. The image is pure magic, as is the enduring coexistence of man and nature in this unlikely sanctuary. The town of Bled, Slovenia, lies 50 km northwest of Slovenia's capital, Ljubljana, and is easily reached by train or bus. Once in Bled, boats run frequently from the lake's shores to the island. Even the most amateur photographers are guaranteed to get a great shot of the island thanks to calm waters and the boat's slow approach, but shutterbugs and professionals know to hike up the hills surrounding the lake, notably Straza and Osojnica, for views well worth the climb. Rachel is an editorial intern at Gentedimontagna. You can follow her on . She travels for the street food and the clean public transportation. Узнайте про авторитетный web-сайт , он рассказывает про https://www.biceps-ua.com.